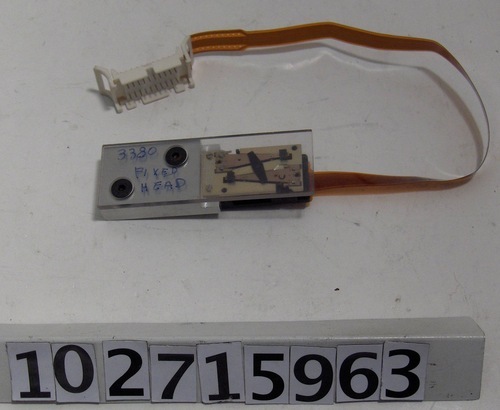 Object consists of a fixed head assembly for an IBM 3380 disk drive in an aluminum and plastic display fixture with attached flat cable and plug. The 3380 was never marketed with this feature. The display card with this object reads, "3380 FIXED HEAD FEATURE--~1982 IBM 3380 Head configuration, two heads in a structure, Thin film head, cermet slider."